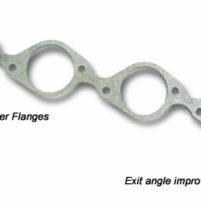 Small block Chevrolet 23°, 15°/18° & Splayed Valve cylinder heads suffer from short exhaust ports. Once these 1/2″ thick aluminum adapter plates are bolted in place you can port them to match you exhaust ports thereby increasing their length and improving performance. The bolts that attach the plates are flush mounted into recessed holes. 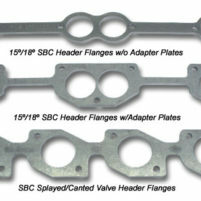 This and the staggered bolts pattern of our header flange provide increased clearance when using larger diameter primary tube headers. 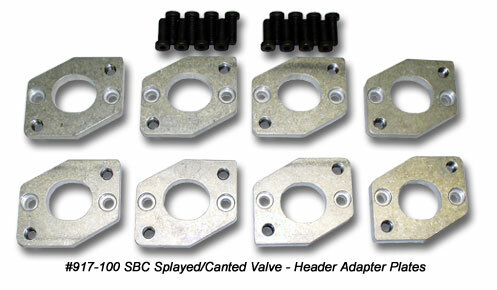 Also, note that the bolt pattern for our RMRE adapter plates provides more clearance for the spark plugs and greater support for hanging the headers. (i.e. 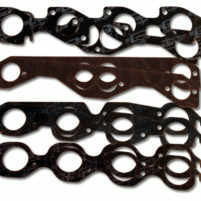 Note that the center plates have two holes at the top for greater support and one hole at the bottom).